To add strength and durability in day to day life, the Aluminium Windows are the best solution. They offer fulfillment of all sorts of needs and now have become a part of the home decor other than offices. 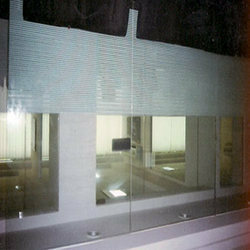 Clients can get a wide range of structure glazing systems that are made in all variants and can also be made as per the clients need. Being in the business with 20 years of experience, we are rendering Aluminum and Glass products to best of our abilities. The wide range of product that we have are Aluminum Door & Window, Aluminum Door & Window partition, Electrical Door, Aluminum Composite Panels, Partitions, Aluminum Fabricator with Tafan Glass, PVC Flooring, Aluminum Windows, Aluminum Sliding Doors and Structure Glazing. The products gain lime light for accuracy, excellent finish and durability among the clients. Our goodwill in the market is a strength to our roots. The add on to this is the well planned infrastructure that helps in rightful completion of the tasks. Our structure has various units that bring flawless efficiency in the final product. These units are the manufacturing unit, research and development unit, quality check unit and warehouse & packaging unit. They all work together to bring the set norms as well as client requirement in to implementation.